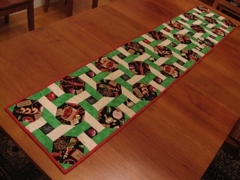 Summer Veggies was inspired by fabrics found in the Keepsake Quilting catalog. 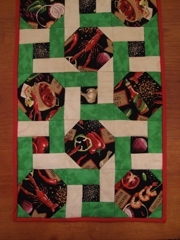 As I came up with a design I incorporated more veggies, of the same fabric line, which I found at quilt shows. 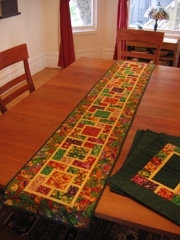 A different company later came out with a similar line but of a larger scale. 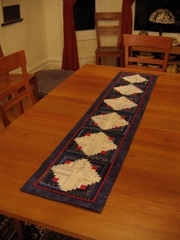 I was happy I found the smaller ones as they were much more suited to the scale of the project they inspired and were such fun that I made four place mats to go with the runner. 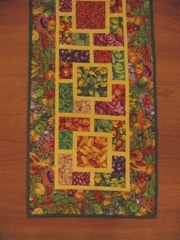 The yellow paths are for the sunshine every good vegetable garden needs. 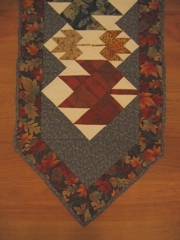 Autumn Leaves was made as a gift for an extended family Thanksgiving dinner. 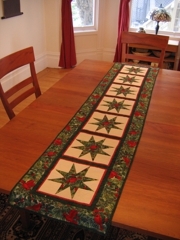 I like the border fabric so much I consider it one of my all time best finds. 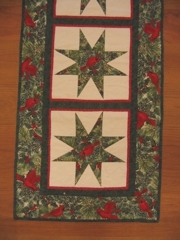 The same year I made Cardinals for Christmas because the autumn leaves were so well received. 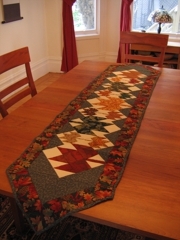 Both can be used for a season rather than a day which makes them even more useful. 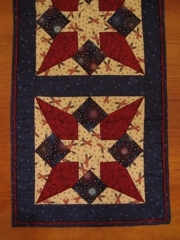 Golden Stars in a Winter Sky was inspired by a full sized quilt pattern in Quilt magazine. 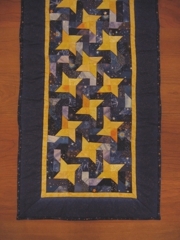 The stars are made of many yellows and the blues in the background are all printed with stars. 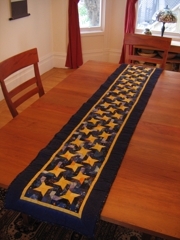 A parallel project of different design was a quilt for granddaughter Amelia and used a similar idea of yellow stars on a blue background with pictures of her family. 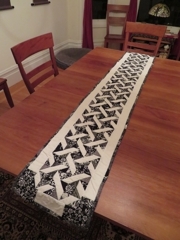 Two more quilts are planned with these fabrics but I'm waiting for a yellow being hunted on the web. 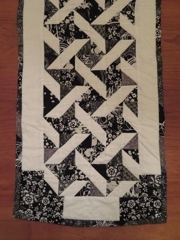 All the others were ideas I initiated. 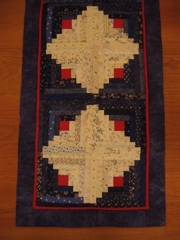 The color choice for this was the recipient's but the pattern choice was mine. 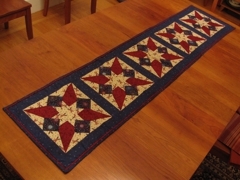 The basic block is called Friendship Star because of the four pointed star, but this is a variant because the corner blocks are made of two triangles rather than the basic square of fabric.